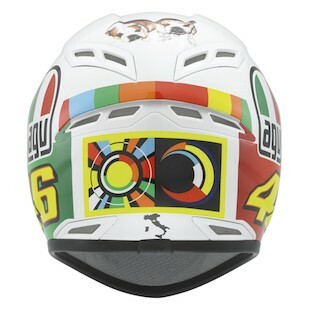 This is the limited edition replica of the helmet worn by Valentino Rossi during the MotoGP at Mugello. 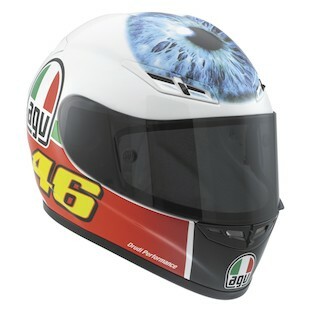 For his avid fans and collectors, here's the AGV GP-Tech Mugello Valentino's Eye LE helmet with clear, crisp graphics of Valentino's blue eye, #46, the sun & moon, Italy and his bulldogs featured on the helmet. All the top of the line attributes of the AGV GP-Tech are incorporated: dual-density carbon Kevlar construction, ventilation with the Integrated Ventilation System , fully removable and washable CoolMax liner and anti-fog and anti-scratch poly-carbonate clear Racer-X visor with tear-off system.